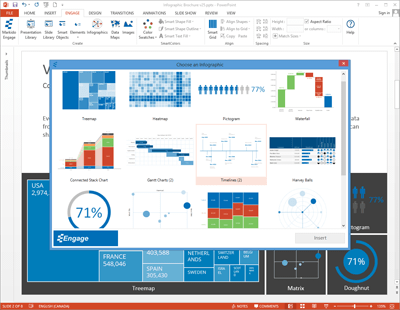 Markido Engage - The most infographics in PowerPoint ever. 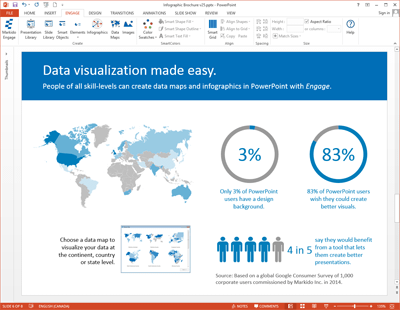 Create better PowerPoint presentations in less time. Engage is a PowerPoint add-in that lets you create amazing slides. Works with Windows versions of PowerPoint 2007 - 2016. Do you have a Mac? Trusted by organizations and professionals around the world. The most impressive PowerPoint presentations. Guaranteed. 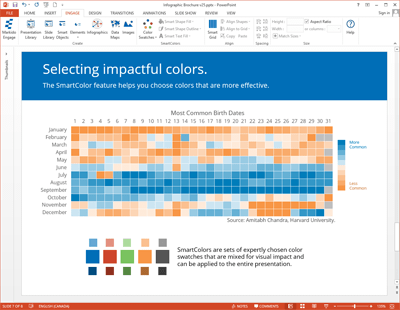 People of all skill levels can create data maps and infographics like treemaps, heatmaps, waterfalls, marimekko, and pictogram charts in PowerPoint.